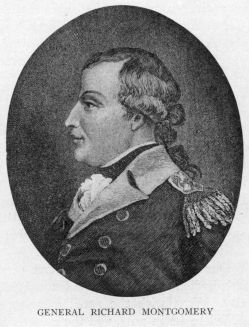 The American soldier Richard Montgomery was born in County Dublin, Ireland, in 1736. Educated at St. Andrew's and at Trinity College, Dublin, he entered the British army in 1756, becoming captain six years later. He saw war service at Louisbourg in 1757 and in the Lake Champlain expedition of 1759, and as adjutant of his regiment (the 17th foot) he shared in the final threefold advance upon Montreal. Later he was present at Martinique and Havana. In 1772 he left the army, settled in New York, and married a daughter of Robert R. Livingston. Three years later he was a delegate to the first provincial congress of New York, and became brigadier-general in the Continental Army. He was sent with Philip Schuyler on the Canadian expedition, and, on Schuyler's falling ill, the command devolved upon him. Hampered by the inclemency of the season and the gross indiscipline of the troops, he went forward, gaining a few minor successes and capturing the colors of the 7th (Royal) Fusiliers, and met Benedict Arnold's contingent at Point aux Trembles. They pushed on to Quebec barely 800 strong, but an assault was made on the 31st of December 1775, and almost at the first discharge Montgomery was killed. The body of the American general was honorably interred by the Quebec garrison. Congress caused a memorial to be erected in St. Paul's church, New York, and in 1818 his remains were conveyed there from Quebec.